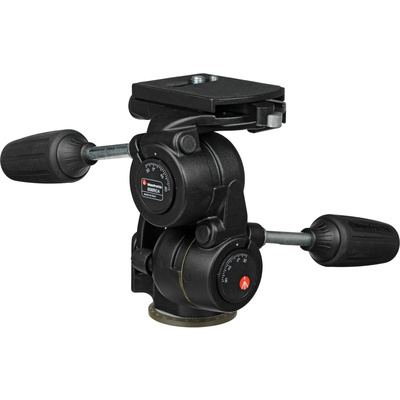 Product #1183 | SKU 808RC4 | 0.0 (no ratings yet) Thanks for your rating! The Manfrotto 808RC4 3-Way Pan/Tilt Head is the redesigned model in the three-way range of heads. The 808RC4 now also includes the Double Axis Spring System which consists of a built-in 1.5 kg spring for both the front tilt and side tilt movements. It also incorporates dual axis bubble levels to better achieve level shots. This innovative solution, borrowed from the video industry, helps to move the camera smoothly while framing the picture, as it helps to balance some of the camera weight. In addition, it absorbs the shock to bodies and lenses when reaching the end stop of the head movement. One or both springs can simply be turned off by the two separate control knobs, for when using an extremely lightweight camera system. Modernised overall shape and many of the hard edges have been rounded to produce a fresh and elegant product. A new coating on the quick-release lever that is more durable and scratch resistant. Newly designed handles to fit comfortably in the hand, even taking into consideration the size of fingers.